Back Row Left to Right: Brett Palmer (AbiJack Management, Inc) and Kenny Chesney. 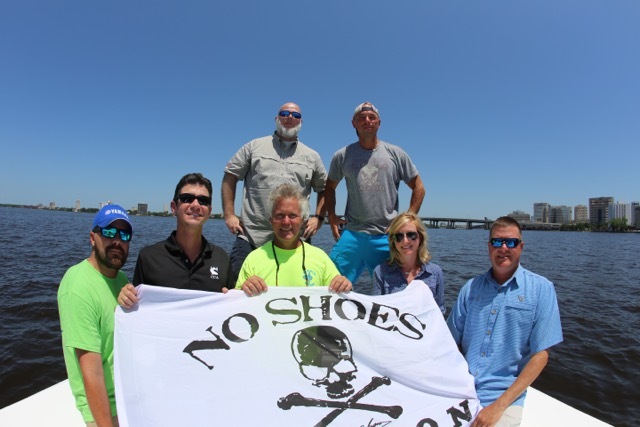 Jacksonville, Fla. (June 29, 2015) — Kenny Chesney got to do something very special before his sold-out Florida Country Superfest show June 14: the East Tennessee songwriter/superstar visited the first two No Shoes Reefs in Jacksonville’s St. John River. Named the Coastal Conservation Association and George Holt Reefs, the man-made reefs – designed to promote quality of aquatic life – were built through the support of Chesney’s ongoing partnership with Costa Del Mar Sunglasses and The Coastal Conservation Association/Building Conservation Trust. Thirteen-hundred tons of concrete was used to create the two reefs. In total, 18 barge loads were needed to carry the material to the two designated reef sites. Each reef measures 200’ x 200’ – and were built in a two-week time frame to minimize disruption. “Looking at the underwater sonar, it’s amazing,” Chesney marvels. “In only 18 months, these reefs aren’t just alive, they’re thriving with life. As a guy who has so many of my happiest memories on the water, I couldn’t be happier to be a part of creating something like this in partnership with the City of Jacksonville, the people at the Coastal Conservation Association and the sales of my line of sunglasses with Costa Del Mar. Easily accessible by boats, the reefs provide a much-needed habitat and improved fishing in this section of the river, which is approximately 20 miles inland from the Atlantic. Drawing inspiration from life on the water, the 8-time Academy of Country Music/Country Music Association Entertainer of the Year hopes to insure the future of the oceans and beaches for generations to come. Already announced as the headliner for the 2016 Florida Country Superfest, Chesney continues his 2015 Big Revival Tour this weekend with stops at Ava Amphitheater in Tuscon, Ariz. and The Joint at Hard Rock Hotel & Casino in Las Vegas, Nev. The Coastal Conservation Association national habitat program, Building Conservation Trust, is dedicated to the creation and restoration of marine habitat throughout the U.S. Through CCA’s more than 125,000 members in broad-based state chapters, BCT has created successful collaborations of business, non-profit organizations, government agencies and private citizens to revitalize critical habitat and establish a vibrant foundation for the marine ecosystem.